LOCATION: Cambodia has been around since 2011. Here you'll find lots of stories and pictures from the Hester family. The family is involved in a wide variety of ministries - serving women, children, doing leadership development, health services, and more. Also be sure to check out The Trotter Family. 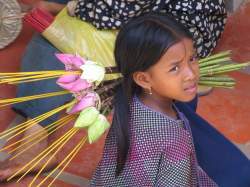 You can read several years worth of reflections from the south-central region of Cambodia. Finally, our most experienced blogger currently in Cambodia is at Early Morning Missionary. Starting back in 2008, this blog has given us more insights into culture, missionary life, and God's work in the world. Do continue to pray for the Kingdom of Cambodia. Years of war saw the death of millions of people and destruction of much of the country's infrastructure. The country continues to recover, but few know the name of Christ. Cambodia is still known as the most "landmined" country in the world, and so many continue to be killed or severely injured from a "finished" war. Many families are still torn apart from past violence. Check out these blogs and encourage the Christian missionaries who are sharing God's Word in Cambodia! For the latest in missionary blog posts, check out Missionary Blog Watch!